Following the 11am – 12noon ‘guided meditation & music’, the monthly ‘day-long meditation begins. One can meditate as long and leave as one wishes; however, if one leaves the building, there will be No re-entry until 6:30pm, when the front door will re-open for 7pm Aarati. Simple vegetarian foods/snacks will be available. The Just Kids! Monthly 2-hour program from 4pm – 6pm will meet in the children’s room. Children from ages five (5) to twelve (12) are welcome. 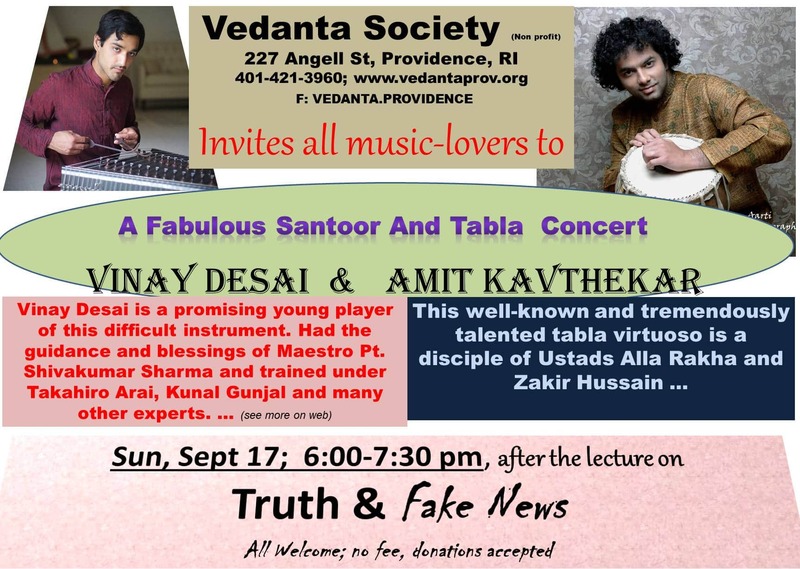 Santoor and Tabla Music concert will be performed by Vinay Desai and Amit Kavathekar. All Welcome; No fee, donations accepted. Click here to the flyer. At 100 Cherry Brook Rd, Canton CT. Swami Yogatmananda will discuss ‘Bhagavad Gita Musings: Divine Incarnations’. The program includes a sort worship, music, and refreshments . All are welcome. On Thurs. Sept 14, and on Wed. Sept 20, the birth anniversary of Swami Abhedananda, and Swami Akhandananda, direct disciples of Ramakrishna, will be observed in the morning with a chant and in the evening with a song, and a short biography reading. Durga Puja will be observed from 11:00am –7:00pm on SAT. Sept 30 (NOT SUN). The day includes ritual worship & food offering by swami; flower offering by devotees; devotional singing/music; a video-showing; readings and more. Swami Yogatmananda and devotees traveled to Vivekananda Retreat at Ridgeley NY to conduct a retreat on: Day-Dreaming and Meditation-Jungian and Vedanta approach. About thirty devotees participated. They returned late Sun evening, Sept 03. About 20 devotees attended on Thursday and Friday as Pravrajika Satchitprana (Sri Sarada Math, India) offered satsang: a talking dialogue from 7pm – 8pm. Fifty-two devotees attended the retreat on: ‘ ‘Devotional Practices for this Age’ conducted by Pravrajika Satchitprana ( Sarada Math, India) from 10:00am – 5:00pm. The day consisted of two discourses; a hatha yoga session led by Pat B; devotional music; a two-our Q/A session with Pravrajika and Swami Yogatmananda; meals and snacks. Twenty-seven devotees attended this workshop on ‘Eight Limbs of Sufi Yoga’ at Vedanta conducted by Netanel Miles-Yepez – a well-known Hassidic-Sufi Teacher. One Hundred Fifteen people attended this annual ‘Universal Brotherhood Day Program from 5:00pm –8:00pm. The program flowed as per details given below. Swami Yogatmananda welcomed everyone: The tradition of Universal Brotherhood Day started after the attacks on the twin towers on 9/11, and was established to encourage interfaith harmony. It also commemorates Swami Vivekananda’s historic speech at the World Parliament of Religions on 9/11/1893, and the founding of the Vedanta Society of Providence on 9/8/1928. Kathleen Adams, Music Director at the Annisquam Village Church and Devotees sang The Mission, about Swami Vivekananda’s voyage to the west. Reverend Trudi Hirsch from Zen Mountain Monastery: When the Buddha was enlightened, he said that each of us is perfect and complete, lacking nothing, but we have not yet realized this. The Reverend had an experience at 16 years of age, of dancing effortlessly, after expending great effort. This lifted her spirits, and stayed with her until now. Separation and clinging create suffering. What we hold most dearly needs to go. The monk Joshu said that just because it is so clear, it takes a lifetime to realize it. The Ruach Singers lead by Diane Min sang some spiritual songs. Kasturi and Friends sang a song about Lord Krishna, by Lalan, and a song to the Guru, by Murshid. Netanel Miles-Yépez, Sufi Pir, Hassidic student, and Professor of Comparative Religions at Naropa University: We find joy in associating with those on the spiritual path. Reb Nachman of Breslov told a story about a poor man who dreamed that a treasure was far away, and took a journey to find it, only to discover that the treasure was in his own home. The moral of the story is that we have to go very far to find what we already had. Father Thomas Keating said that he did not know how he could have gotten where he was without the dark nights of the soul. We need to cultivate the soil, or the seed will not grow. In Kabbalah, Chesed (loving kindness) and Gevurah (discipline), are reconciled by Teferet (compassion). Amritpal Singh and his Son sang from the Sikh tradition. Swami Tyagananda from the Vedanta Society of Boston: As human beings, we juggle ‘me, the world, and something higher than the world’, which we call God. Self-effort consists of things I can do myself, whereas God’s grace consists of things that I cannot do, but that God does. Neither has standing on its own. There is a tension between God and me, as what God does may seem to be random or whimsical. If I relate to the Divine, I begin to see a connection. As the relationship becomes stronger, we become One. Then, the tension between self-effort and grace disappears. Swami Yogatmananda thanked the speakers, the musicians, and all who attended. He introduced Abhishek Kumar Sharma, who is on a world bicycle tour to promote awareness of climate change, and world peace. Conclusion: The program concluded with devotees singing Namaste and Auspicious Mother Divine. Then, we had a delicious dinner prepared by members of the India Museum and Heritage Society. Page # 997-99 – May 8, 1887 : Conversation was going on between Narendra (Swami Vivekananda) and Sarada Prasanna (Swami Trigunatitananda) about the nature and existence of God. It is very difficult to fathom the real nature of God with our limited understanding. The entire world is created and run by His maya. One may try to understand the Lord by surrendering at His feet. God is all merciful and compassionate. One may question that how we can have misery and predicaments in the world if God is so kind. The adversities are planted in human life to connect with the Lord. Sufferings make us prayerful. They help to establish connection with God by disconnecting oneself from the rest of the world. Miseries take us closer to God, to our real nature. At times, Narendra has denied the existence of God and emphasized that man is the maker of his destiny. This may lead to confusion for a reader. But one must understand the context behind the teachings to grasp the meaning completely. On the next day morning, M was reflecting on the Master’s life, his teachings and his monastic disciples who were leading the life of renunciation. Looking at the monastic disciples he was wondering is there a way for the householder disciples to get liberated? Liberation can be attained by householder devotees by practicing internal renunciation and detachment while living in the world.